Are you sick of waiting for your dream job to appear? Are you bored of dragging yourself through your list of daily work tasks? Do you wish you had more opportunities each day to put your strengths to work? Researchers have found that by taking a ‘develop mindset’ to our jobs and finding ways – often small and sometimes large – to align them to our strengths, we can feel just as passionate, satisfied and successful at work as people who land their dream jobs. All it takes is a little job crafting. Turn your daily to-do’s into tah-dah’s by flavoring your choices of what, how, and why with your strengths so you can supercharge your ability to meet your current responsibilities. Transform your job description into a calling description, so you have a simple way to start consistently prioritizing more of what you do best each day. Get clear on what your strengths-fuelled future at work could really look like so you can create the career you really want. You even have our full permission to steal these tools with pride and use them for yourself, your team or your clients (you can even rebrand them if you want). A short training video explaining how job crafting works. 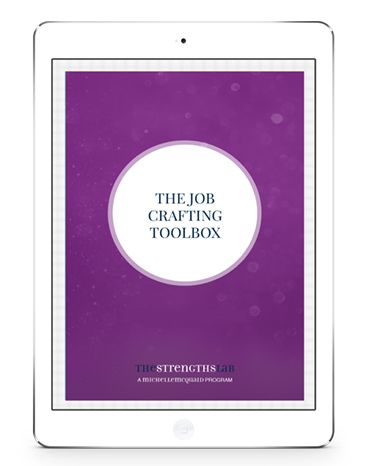 An introduction pdf guide that outlines the business case and practical ways anyone can job craft. Done-for-you templates and playsheets to download, print, and steal with pride to help you job craft on the spot with your daily tasks by creating Strength Surge moments, turn your job description into a calling description by exploring ways to task craft, relationally craft and cognitively craft around your strengths, and discover your best possible future self to prioritize the choices required to create the career you most want.